Lamppa Manufacturing, a small company that builds Kuuma Sauna Stoves and Vapor-Fire Furnaces, has developed a truly smokeless warm-air wood-burning furnace. The Kuuma Vapor-Fire 100 recently achieved Phase 2 EPA certification exceeding the 2020 emission standards by almost 40 percent, which presently, no other wood stove manufacturers are able to accomplish. Lamppa Manufacturing, a small company that builds Kuuma Sauna Stoves and Vapor-Fire Furnaces, through years of experimentation, has developed a truly smokeless warm-air wood-burning furnace. The Kuuma Vapor-Fire 100 recently achieved Phase 2 EPA certification exceeding the 2020 emission standards by almost 40 percent, which presently, no other wood stove manufacturers are able to accomplish. The Kuuma Vapor-Fire 100 is the cleanest warm-air wood-burning furnace in existence. The proprietary system is designed to provide the right mix of air for each burn level and moisture content using computer technology to continuously adjust the furnace controls for maximum efficiency. 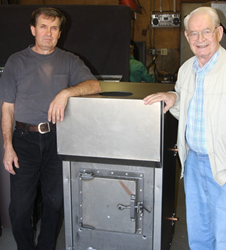 “It's a true wood gasifier,” said Lamppa Manufacturing owner, Daryl Lamppa. 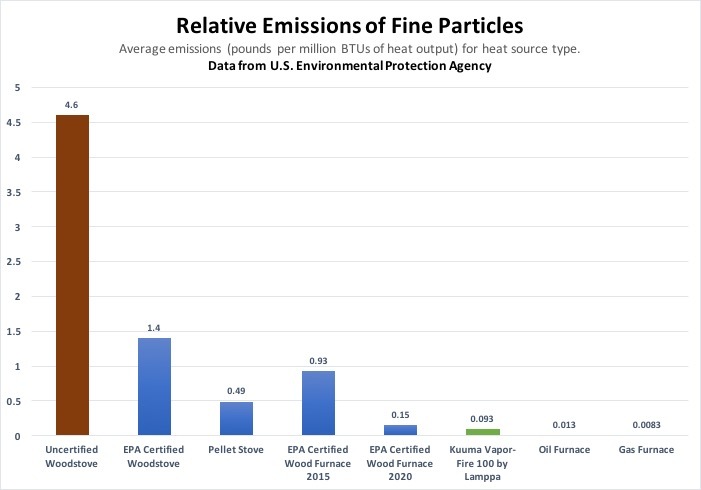 The Environmental Protection Agency Phase 2 emissions standard requires wood furnaces to emit no more than 0.15 pounds of emissions (soot) per million BTUs for each burn level, which is an 84 percent reduction from the current emissions standard that was effective as of 2015 (the current standard is 0.93 pounds per million BTUs). The requirement has created a major industry hurdle, which has driven many wood furnace manufacturers to shut down. However, Daryl and his father, Herb Lamppa, demonstrated through testing conducted by an EPA-certified lab, Intertek, that the standard could be met and exceeded. Wood stoves and furnaces can create problems, such as the buildup of dangerously flammable creosote in chimneys and significant amounts of other pollution. Fine ash and unburned gases can create respiratory problems and those pollution concerns drove the federal action to reduce emissions. When the tighter regulations were enforced, Daryl and his father Herb were able to meet them because they had been working on the technology decades before the standards were created. In addition to being clean burning, the Kuuma furnace reduces wood consumption by 30 - 40 percent compared to other wood furnaces. "Replacing one old-style dirty furnace with a modern, clean-burning furnace like the Vapor-Fire 100 is equivalent to removing 700 cars off the road," according to the Environmental Initiative. Lamppa firmly believes that wood heat can be extremely environmentally green and inexpensive. It doesn't contribute to climate change, such as burning oil or other fossil fuels. In fact, the Vapor-Fire 100 allows for significantly less wood to burn at nearly the emission level of natural gas, which makes this one of the cleanest, environmentally-friendly and convenient methods to heat homes. This leader in warm-air heating uses a renewable energy resource, which supports clean energy and forestation efforts so crucial in today's world climate. The innovation, which took many years and several hundred thousand dollars investments to test, has Lamppa Manufacturing headed toward expansion. Lamppa hired Dale Horihan, a Minnesota native and seasoned CEO advisor, to manage the manufacturing plant and lead the company's growth. The wood furnace industry sells around 28,000 units per year and generates more than $150 million in revenues. Because the barrier to reach the EPA's Phase 2 standard by 2020 will likely leave other manufacturers out of business, the opportunity to achieve even a 10 percent market share would mean a significant impact for Lamppa and the Tower community, increasing the workforce and providing dozens of well-paying jobs. Thursday, December 7, the Tower Economic and Development Agency (TEDA) approved a motion to recommend that the city of Tower move ahead with construction of 8,000 - 8,500 square foot building in the industrial park, about half of which would be occupied by Lamppa Manufacturing. The additional space would be available for other prospective businesses or for later expansion by Lamppa. While there were many furnace manufacturers up until recently, only five remain, according to Lamppa, and one is located in Canada. If the manufacturers are unable to achieve 2020 standards, Lamppa's wood furnaces may be the only ones to be legally built and sold in the U.S.
Lamppa Manufacturing builds Kuuma Sauna Stoves and EPA-certified Vapor Fire Furnaces in Tower, MN. The Kuuma Vapor-Fire 100 Furnace is the first and only forced-air wood burning furnace to achieve 2020 USEPA emissions standards certification, which makes it the cleanest, safest and greenest wood furnace in existence.